This highly readable, spectacularly illustrated compendium is an ecological journey into a wondrous land of extremes. The California Deserts explores the remarkable diversity of life in this harsh yet fragile quarter of the Golden State. In a rich narrative, it illuminates how that diversity, created by drought and heat, has evolved with climate change since the Ice Ages. 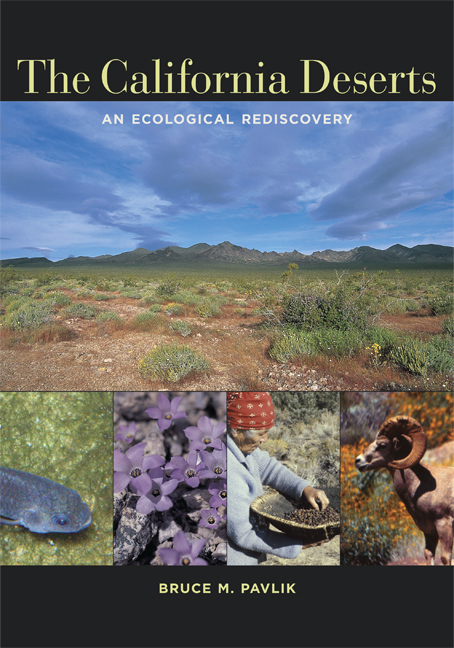 Along the way, we find there is much to learn from each desert species— whether it is a cactus, pupfish, tortoise, or bighorn sheep—about adaptation to a warming, arid world. The book tells of human adaptation as well, and is underscored by a deep appreciation for the intimate knowledge acquired by native people during their 12,000-year desert experience. In this sense, the book is a journey of rediscovery, as it reflects on the ways that knowledge has been reclaimed and amplified by new discoveries. The book also takes the measure of the ecological condition of these deserts today, presenting issues of conservation, management, and restoration. With its many sidebars, photographs, and featured topics, The California Deserts provides a unique introduction to places of remarkable and often unexpected beauty. Bruce M. Pavlik, Professor of Biology at Mills College, is coauthor of Oaks of California and California's Changing Landscapes: The Diversity and Conservation of California Vegetation.